Surah al-Kahf, the eighteenth chapter of the Holy Quran, narrates at length an account of Dhul-Qarnain – the one with two centuries. The account commences from verse 86 and continues from that point onwards. We all know quite well that the Holy Quran is not simply a book of history that merely records historical events to establish its authenticity. 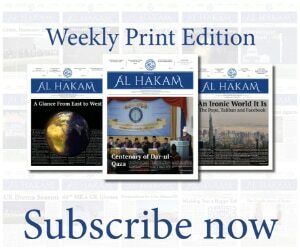 The stories mentioned in the Holy Quran have in them a plethora of prophecies relating to future events. The tale of Dhul-Qarnain also belongs to the same category. It not only accounts the military exploits of a great and noble conqueror who lived in the past, but also contains prophetic reference to another great historical personage, a world reformer, who was to appear at some point in the future – the time that we are fortunate to be living in. The appearance of this reformer, who has been named “The Promised Messiah and Mahdi”, has been repeatedly mentioned in Muslim Scriptures (Sahih al-Bukhari, Sunan Ibn-e-Maja and other books of Hadith). Thus, the story of Dhul-Qarnain holds both a historical and spiritual significance and hence, warrants particular focus in research. Lexicons inform us that Dhul-Qarnain is an Arabic word that refers to an individual who finds two different centuries. Almost every Muslim school of thought recognises the prophecy to be foretelling a series of reformers within the Ummah for Muslims, each century, after the advent of the Holy Prophetsa. However, a devout companion of the Promised Messiahas, Hazrat Pir Siraj-ul-Haq Numanira, saw this in a novel way. Interestingly, the Promised Messiahas acknowledged this new angle and endorsed the veracity of the message and its logic by including it in one of his own books. “The Holy Prophetsa declared that Allah the Almighty would surely raise a person for this ummah at the beginning of each century, who would revive its faith for it. This great Hadith possesses a virtually unbroken chain of narrators and has reached a consensus of opinion. “Whatever interpretation commentators of the Holy Quran, muhaddithin or sufis make of it, the meaning, which Allah Almighty has taught me, is that this Hadith is in reality concerning the Promised Messiahas. This is because former and future reformers are all but a reflection and we, in short, believe that reformers have appeared at the beginning of each century, in one form or another. “However, we cannot explicitly say with certainty who the reformers were in all of the centuries that have elapsed. This is due to the fact that the Holy Prophetsa did not list the names of reformers. 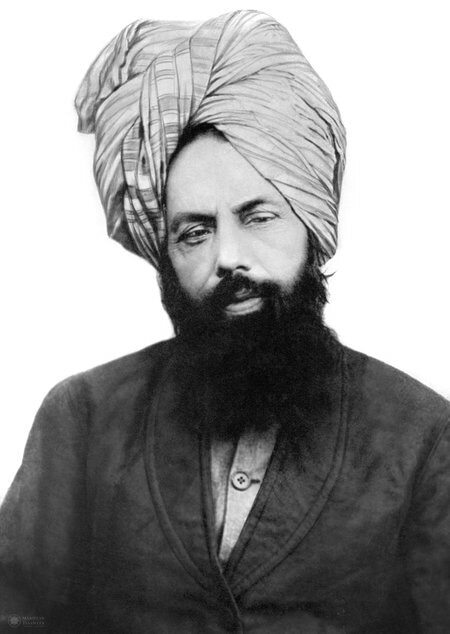 But as for the Promised Messiahas, we can say – supported with certain, concrete arguments and with conviction – that the reformer prophesied by the Holy Prophetsa to fight in his way and cause is the Promised Messiahas; the Hadith states: ‘How can such a nation be destroyed where I am at its beginning, the Promised Messiah at its end and Faij-e-A‘waj [1,000 years of spiritual and moral degradation] in between’. “A sign of his advent that he foretold was that he would be raised in an age when different centuries would meet. Hence, when we look at the matter in depth, we find that that particular age is this very age in which the greatest reformer was sent, and he met the beginning of all calendars; 1318 Hijri, 1901 AD, 1307 Fasli and 1957 Bikrami. Moreover, he was present in the seventh millennium – the mother of centuries. Thus, the prophecy, ‘at the beginning of each century’ has been fulfilled through the combination of these calendars. A study of the great works of the Promised Messiahas reveals that he presented this unique and subtle sign to prove the truthfulness of his Master, Prophet Muhammadsa, and as truthfulness of his own claims as well. However, objecting to the final line of the extract, opponents of the Promised Messiahas demand that sayings of the Holy Prophetsa regarding Dhul-Qarnain be brought forth. They, in reality, are mistakenly fixated on the word “Dhul-Qarnain” and ignore the narration which has been cited above and recorded in Abu Daud. Those who sincerely seek the truth should know that the book, Kamaluddin wa Tamamun-Ne‘mah wa Ikmaluddin wa Etmamun- Ne‘mah, written by the great Shia scholar, Muhammad bin Ali bin Babiwayh al-Qummi also contains mention of the word Dhul-Qarnain whilst discussing the advent of the Imam Mahdi. In early February 1904, Hazrat Hakim Maulvi Nuruddinra wrote a rebuttal to the book, Tarak-e- Islam. His work, synonymous with his name, was titled, Nuruddin. On page 251, a painstaking research is included in it, which lists 32 calendars and the turn of their centuries. The agreed date of birth of the Promised Messiahas at the time of writing this book was 1839. 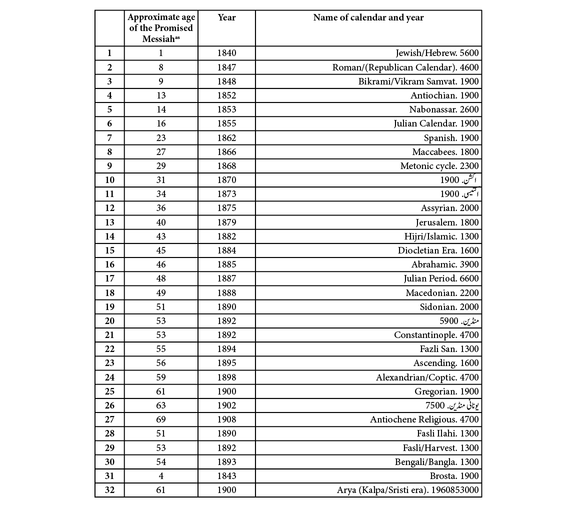 The research by Hazrat Mirza Bashir Ahmadra, proving the year of birth to be 1835, came later, making no difference to Hazrat Khalifatul Masih I’sra point. A study of the history of the world shows that the number of calendars that have been used worldwide are around 80, whereas today, only a few are in frequent use, such as the Gregorian, Chinese, Hebrew, Islamic and Persian calendars. The calendars in use are generally solar or lunar and sometimes run on both principles. Of course, the research regarding calendars as cited here was carried out in a small village with limited resources, a century ago. Now that we live in a world where research has become far easier, we invite those Ahmadi researchers with particular interest in the study of calendars – or Horology – to carry out detailed research on this topic and write to us with their findings. We believe that any such study will enhance our belief in the fact that the Promised Messiahas was indeed Dhul-Qarnain – the great reformer at the turn of many centuries.